SJ - a jabber-client communications with integrated encryption in automatic mode. Our client uses the latest advances in cryptography, methods of transmission and reception of data, as well as ways to create a user interface. It is built on WPF (extension. NET framework) and the language of XAML, which allows you to create interfaces for current and future versions of Windows. Encryption SJ works through a system of OpenPGP. This cryptosystem is an asymmetric encryption uses two keys: public and private encryption to decrypt the data. Members share their open (public) keys, and send each other messages encrypted with those keys. To decrypt the received message using its private (private) keys. You can set and fully control them. Encryption is the history of communications necessary for the protection of personal information from using your correspondence by third parties. This feature allows you to refuse SJ third-party encryption programs, while maintaining confidentiality, even in the case of unauthorized access to your computer. SJ uses the protocol XMPP (open library agxXMPP). Implemented XEP-0027 extension, with the addition of its own protocol extensions. 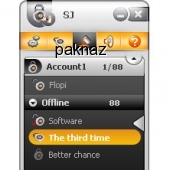 As a result, achieved full compatibility with all popular jabber-clients. And most importantly - a fully automatic exchange of organized public PGP-key. Therefore, users SJ no need to install additional software to support encryption OpenPGP. - OpenPGP key length to 4096 bytes. SJ will help you to securely protect your personal correspondence.